Today, the A' Design Award and Competition has announced its call for entries for the A' International Movie and Animation Design Award. The A' Movie and Animation Design Awards is organised in order to select and honor excellent design works from directors, movie designers, animation artists, videographers, animators, film producers and entertainment brands worldwide. The A' Movie and Animation Design Awards accepts entries in several different design projects such as movie trailers, short movies, commercials, cartoons and animated sequences and more, that were created within the last 10 years. The A' International Movie and Animation Design Award is a two-step competition. The first step is to submit movie and animation projects at A' Design Award website for complimentary preliminary screening. Submissions that pass preliminary screening could proceed with nomination for final evaluation by the grand panel of professional and reputable jury members. Deadline for late entries to A' Movie and Animation Design Award is on March 7, 2018 and results of the competition will be announced on April 15, 2018. 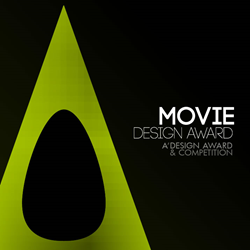 Interested movie and animation designers, companies and brands could register and submit their projects at https://competition.adesignaward.com where further information regarding the design competition such as evaluation criteria, dates and fees, list of juries, entry forms and presentation guidelines could also be obtained. Winners of the A' Movie and Animation Design Awards 2018 will be awarded the A' Design Prize which contains a series of PR, marketing and publicity tools to promote the awarded design projects. Awarded movie and animation talented designers will be given a professional certificate and trophy, a lifetime license to use the award winner logo, get published in the yearbook of excellent design works, and will further be able to have their design works exhibited in Italy and also will receive a personal invitation to take part in the A' Design Awards’ Gala Night Ceremony.